This edition was an exercise in combining traditional hand lettering with computer technology. Lettering and illustrations scanned from original and printed on HP Deskjet 895Cse. 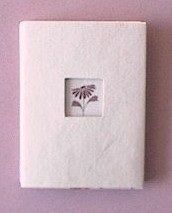 The back of the accordion (not shown) was covered with synonyms for love in rose-colored Roman majuscules.